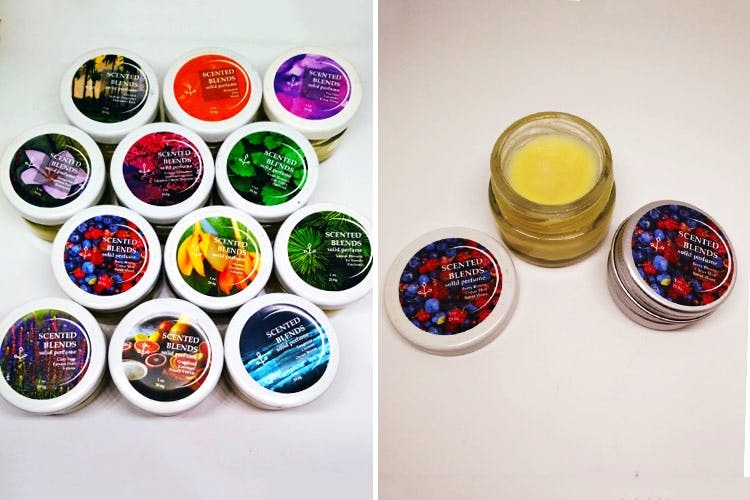 Scented Blends is a new Pune-based brand that’s got nine varieties of solid ittars. They’re made from natural ingredients and are all handcrafted. Between citrusy, floral, woody or earthy notes, they’ve got every kind of perfume lover covered. Aishwarya loved mixing aromas as a hobby, but never thought she’d take it on as a venture. She went far and wide, guided by where her nose took her in search of natural fragrance oils. Then, she got mixing and blending, bit by bit, going by instinct. After few months of mixing like a manic scientist, she knew which ones made the cut and the ones that didn’t, she stored as what she calls ‘experimental rejects’. She uses jojoba oil, essence oils, beeswax and shea butter to create an interesting array of aromas including frangipani, grapefruit, citrus mist, musk, ylang ylang and lots more. Each variant is a combination of three types of scents. Needless to say, we’re confused about which one we want to try first. Soon as we do, we’ll let you in on our favourites. They’re priced in line with everything artisanal, so the small tins (15ml) are priced at INR 850 while the bigger versions in glass jars (30ml) come for INR 1,414. One small box typically lasts for three months if you use it regularly. In that sense, if you do the math, it isn’t that exorbitantly priced for something that’s 100% natural and handmade. For now, Aishwarya does take orders from her FB and Instagram page but also has a shop up and running on Etsy. Dab the perfume on your pulse points (wrists, behind the ears, elbows or behind the knees) for longer lasting fragrance.